Boil macaroni in water until tender to bite and drain. Set aside. In a large bowl add cream, sour cream, chilies, 2 cups Pepper Jack Cheese, 1 cup Mexican Blend, flour, and salt and pepper to taste. Remove from oven and sprinkle remaining cheese on top of the dishes. Try to distribute as equally as possible. Put back into oven this time on the broiler setting and broil for 4-5 minutes until turning brown and cheese is bubbling. Most people have a go-to macaroni and cheese dish. For some it’s their grandmother’s recipe handed down to them, to others it’s opening a box and dumping out the powdered cheese and macaroni (also known as every Friday night at my house growing up). And while I do have my favorite mac and cheese, I like to branch out from time-to-time and spice things up… enter Green Chili Macaroni and Cheese. I find that sometimes macaroni and cheese can be a little too rich for me and so I like to add a touch of heat to even that out. Green chilies are perfect as they add heat, but no so much that your mouth is burning. When having people over and I’m serving mac and cheese, I love to do them in individual dishes. Something about that automatically elevates mac and cheese into something a little more elegant. Start by boiling water to cook the macaroni (you can use whatever shape you want…I went traditional). Then drain the pasta. Add cream, flour, sour cream, cheeses, chilies, salt, and pepper to the macaroni. And mix together. Put into individual dishes and bake. Remove from oven, top with cheese, and place under broiler. Serve warm with bubbling cheese. If you like it with more heat, add a little cayenne pepper or some jalapeños. For a little texture, throw in some corn, black beans or top with avocado. 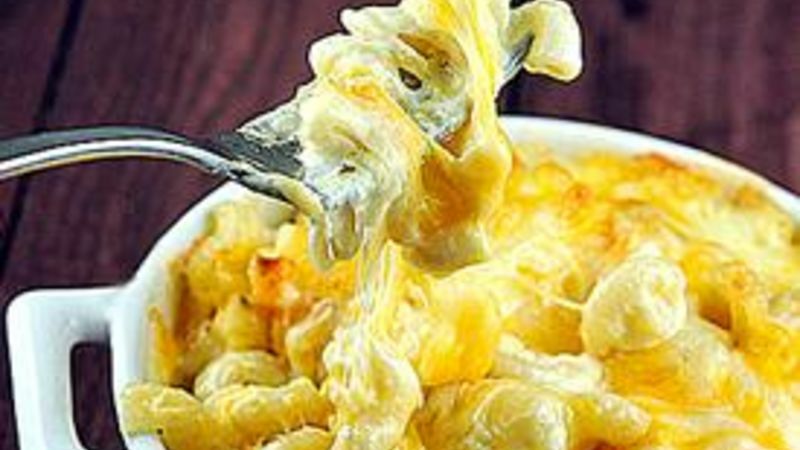 That’s the great thing about mac and cheese… it’s so versatile! Peabody loves ice hockey (she plays!) and all things baking! Check out her great stuff at her blog site Culinary Concoctions by Peabody and her Tablespoon profile. This year she won’t mind sitting at the kiddie table.